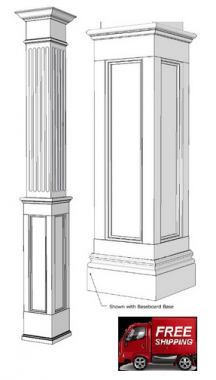 Elite Trimworks offers and full line of Round Columns, Square Columns and Pilasters that perfectly match our Wall Paneled Wainscoting Systems (WPW). 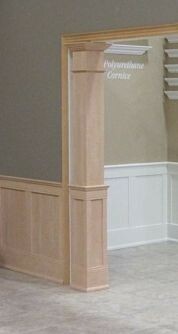 They come in easy to assemble kits where the paneled portion is 38" high which lines up to the wainscoting. 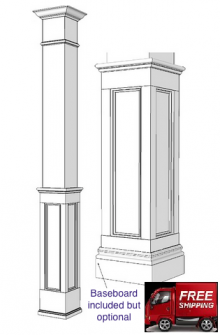 We can make the columns or pilasters any size you like, just give us a call. The biggest thing that sets this Back Band Casing apart from the rest is that one side is substantially thicker than the other. This saves you from buying a Back Band which gives normal casings some heft and dimension. 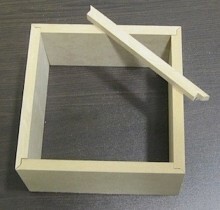 This casing is not made of MDF but rather finger jointed pine, this allows the protruding radius to be much more durable. It comes fully primed. By using a casing like this, you can terminate our wainscoting, by simply running them into the casing rather than having to bevel back to accommodate your existing casing. This will save you time and will create a cleaner finish which in the end will save time and money. 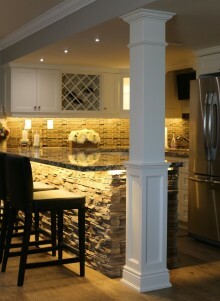 Also available in Oak, Maple and Cherry.